As I’ve mentioned in another post, I have ties to Louisiana and Cajun country. My mother’s sister and her family lived in south Louisiana where we visited every summer. It was on these childhood trips that I was exposed to and developed a love for Cajun cuisine. My cousin Delia is a fantastic cook and has been a big influence on me over the years as I developed my cooking skills. This post was inspired by Delia. Gumbo ingredients can include a wide variety of seafood, meat, poultry, and vegetables. Although gumbo made with fowl is not uncommon, the addition of sweet potatoes might be a bit unorthodox. However, since duck and sweet potatoes are such great companions, I decided give it a shot. Delia serves the gumbo with sweet potatoes, but I cooked the sweet potatoes in the gumbo and I really like the subtle sweet flavor they added. Sage and thyme provided the perfect flavor profile to the duck and sweet potatoes. Making the roux is the first and most important step in making gumbo and requires constant attention for 20-30 minutes. Roux serves as the base flavor of gumbo and the flavor intensity varies according to how dark the roux is. Some cooks like roux that is the color of dark chocolate. I prefer roux to be somewhere between the color of a brown paper bag and milk chocolate. I’ve been making gumbo for years and I learned something new in making this version. As the flour browns in the fat, it loses its thickening properties. Adding a couple of tablespoons of flour to the browned roux will result in the perfect gumbo consistency. As you might know, duck fat has great flavor and I would highly recommend taking the time to render the fat from the excess skin. This step really doesn’t take much time and making the roux with duck fat adds so much flavor and is well worth the time. 2. Trim all excess fat and skin from duck, cut into small pieces and set aside. 3. Salt and pepper outside of duck and inside cavity. 4. Place duck on a rack in a roasting pan. 5. Place roasting pan in oven and cook for 30 minutes. 6. Reduce oven heat to 350 degrees. 7. Continue cooking duck for 1 to 1 1/2 hours or until temperature in the deepest part of thigh registers to 175 degrees. 8. While the duck is roasting, put skin and fat in a small pan and slowly cook over medium low heat. As fat renders, pour into a heat-proof measuring cup. Cook for as long as fat continues to render. 9. When duck is done, remove fat from roasting pan using a turkey baster and add to reserved fat. 10. When duck is cool, remove meat from bones, eliminating as much skin and fat as possible. Cut meat into bite-sized pieces and set aside. 1. Heat 1/2 cup of duck fat in a large dutch oven over medium heat. Add 1/2 cup of flour and whisk until completely blended and all lumps are dissolved. 2. Continue cooking and stirring roux for 20 to 30 minutes until the color is somewhere between a brown paper bag and milk chocolate. When roux is fully browned, whisk in 2 tbsp flour until completely blended. 3. Add onion, peppers, celery, and garlic and mix well. Cook vegetables for 5 to 8 minutes, stirring regularly. 4. Add chicken stock slowly, whisking to mix roux with stock. Bring to boil and reduce heat to simmer. 5. Add tomatoes, andouille sausage, sage, thyme, salt, black pepper, and red pepper flakes. Simmer for 10-15 minutes. 6. Add sweet potatoes, and duck meat. Simmer for 20-30 minutes. 7. Adjust flavor with salt, black pepper, and red pepper flakes to taste. Add parsley and remove from heat. YUM! 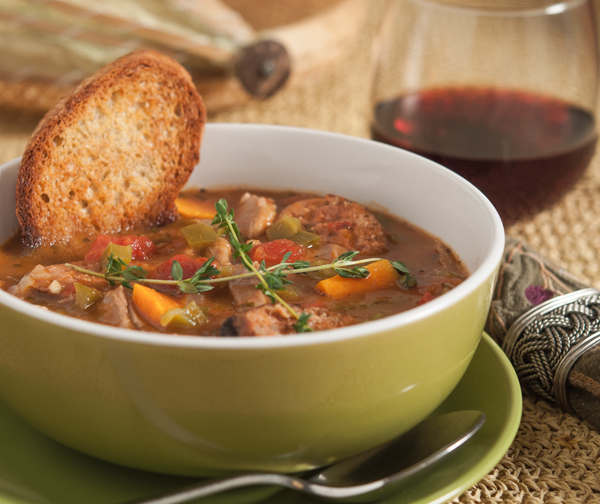 I make a Duck Venison Gumbo about this time each year for my husband and boys – but I’ve never made Duck and Sweet Potato – it sounds delish! I found you on RecipeNewZ (where I’m a pinner) I pinned this and I hope it does well for you because this is a great recipes! Another surprise is duck prosciutto!! I love duck so much (it was my dad’s fave) that I can’t even imagine how fabulous it is!! Never had sweet potatoes in gumbo but boy this looks good. I’ve have to clear the calendar & take a day off to prepare this. Well I never! The very notion of using chicken stock instead of making duck stock indeed. Just kidding, this sounds fabulous! I must try it. I’m so enamored of duck – been making duck prosciutto lately, I’ll bring some when I come to ATL in March.